Electric trains are not a hobby. Baseball cards are not a hobby. Collecting baseball cards is a hobby. Organizing, trading, reading and analyzing baseball cards is an obsession. Collecting electric trains is a hobby, as is erecting electric train sets and villages and what have you’s – generally anything that gets you whacked by the mob. I can understand the joy of electric trains…I think. When I was a kid, I had a long looping wooden track. 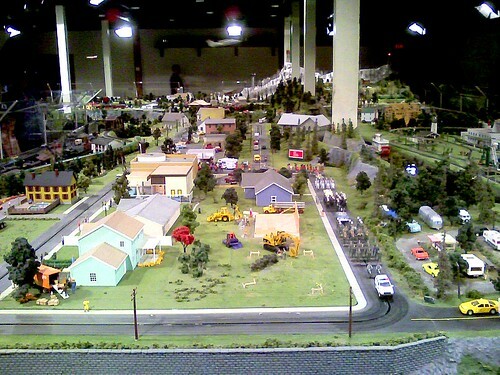 I had hundreds of trains/cars/trucks, etc. I would set them up bumper to bumper in some order that made sense to a five year old. Then I would start with one and push them around. I would then swap some vehicle positioning and push them around the track again. My little mind found this incredibly fun and pleasing. 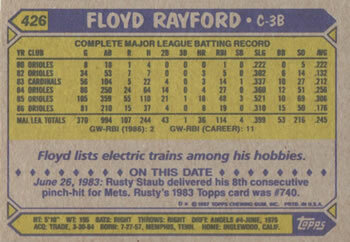 Hey to each his own, Rayford clearly needed a hobby to take his mind off the trials and tribulations of life in the minor/major leagues. Rayford was drafted in 1975 by the California Angels and reached AAA in 1979. The following season, he was traded to the Baltimore Orioles along with a bag o’ cash for Larry Harlow, who had a decent season in 1980 for the Angles but would be out of baseball after 1981. Rayford wasn’t ready for prime time, however, as he spent the majority of 1980 and ’81 in the minors, appearing in the longest game in baseball history, a 33-inning, eight hour and 25 minute affair. He got to play sparingly in 1982 with the big league club and was replaced by Cal Ripken at third on May 30, thus launching the longest consecutive games played streak in baseball history. 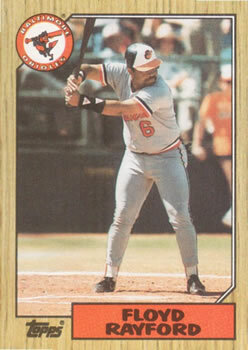 He was bounced between the Cardinals and Orioles for the next few years and would be finished in the majors after the 1987 season, the year this card was printed. Still, he had successes in limited opportunities. In 1985, he hit .306/.324/.521 and 18 HRs in 372 plate appearances. Before he officially retired form ball, he played in the minors from 89-91, appearing in just 81 games as a player. He actually had a tougher task than playing, as he was a player-coach the last two seasons. I do hope he got a World Series ring for 1982, that could be the centerpiece of this model train set.